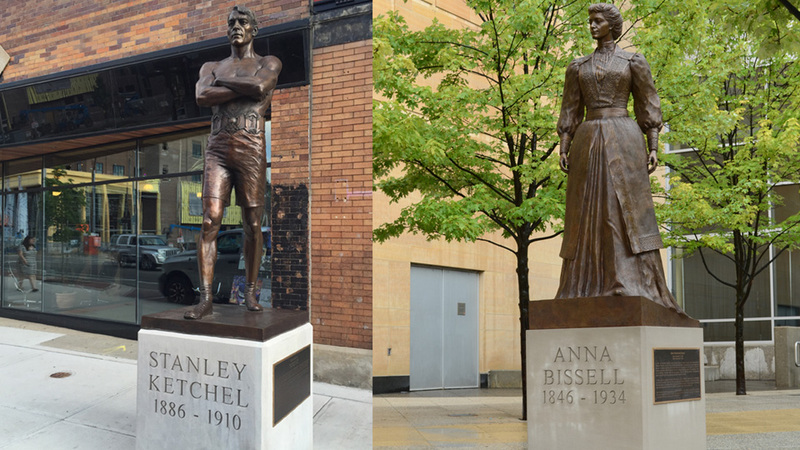 A+J Art+Design | Grand Rapids Community Legends, Inc.
BOXER STANLEY KETCHEL, "The Michigan Assassin"
This sculpture in bronze of boxing legend Stanley Ketchel is located in his hometown which is experiencing urban renewal. 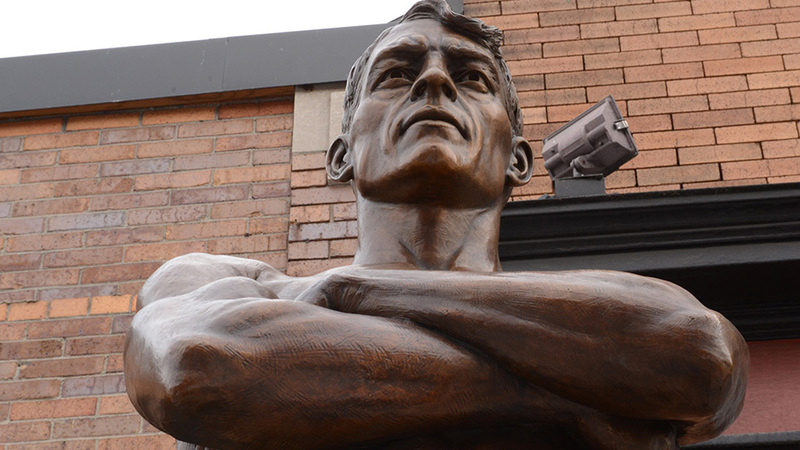 The sculpture emphasizes the great boxer's power and intimidating presence in the ring and is part of the Grand Rapids Community Legends project funded by Ambassador Peter Secchia and the Secchia Family and administered by Frederik Meijer Gardens & Sculpture Park Curator, Joseph Becherer. Grand Rapids Community Legends, Inc. founded by Ambassador Peter Secchia and the Secchia Family Foundation and administered by Vice President for Collections at the Frederik Meijer Gardens & Sculpture, Joseph Becherer. ANNA BISSELL, First Female CEO in the U.S. 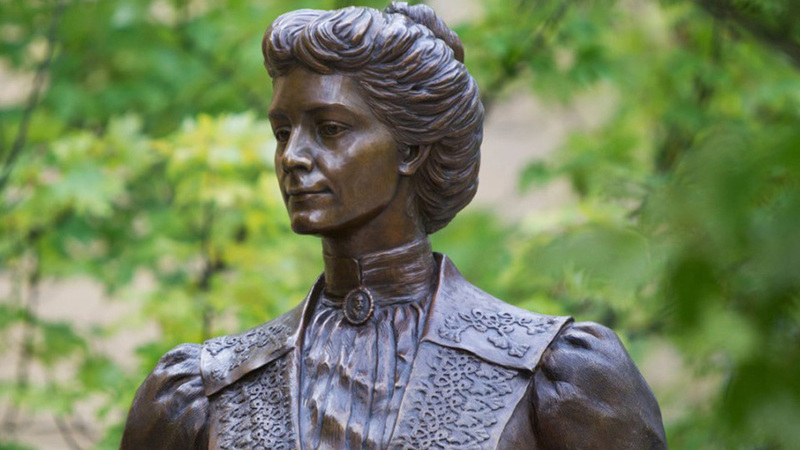 This sculpture pays homage to the story of a great woman whose life encompassed enormous hardship, including: two economic depressions, a devastating factory fire, the flooding of the City, and the loss of her husband when Anna was just in her forties. And still she made history while raising five children. Anna Bissell's strength in the face of grief is an inspiration. By all accounts, the Bissell's marriage was the image of "wedded bliss." (Anna McCay Bissell, "A Tribute"). Loosing Melville broke her heart at the same time as his loss led Anna to the helm of their company in 1889. 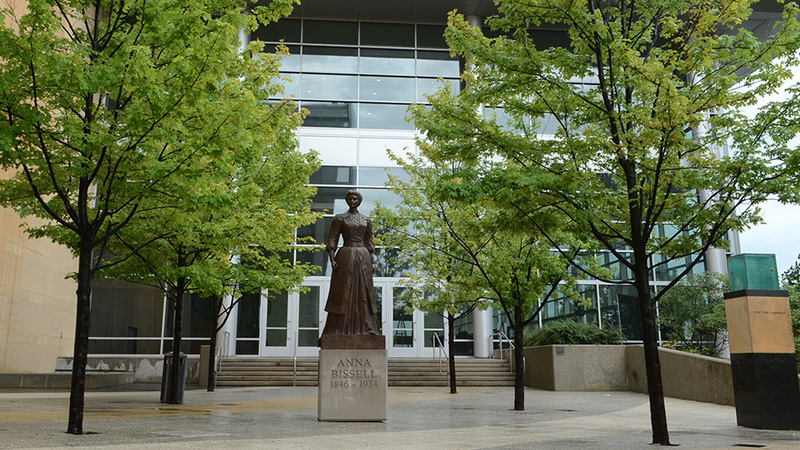 It is this moment that the sculpture captures: Anna stepping into the role of President and Manager of the Bissell Company, literally rising to the challenge on her inclined base. She wears Melville's portrait on her neck brooch. But Mrs. Bissell was known everywhere for her good deeds together with her business acumen and we celebrate her legacy as much for what she did as for how she did it. Her example of ethical leadership was pioneering, especially her worker's compensation and pension system, as well as the many charities she supported. Her caring for others was not merely a characteristic of her successas a businesswoman; it was a reason for that success which is why she is today a much-needed role model for aspiring business leaders everywhere. 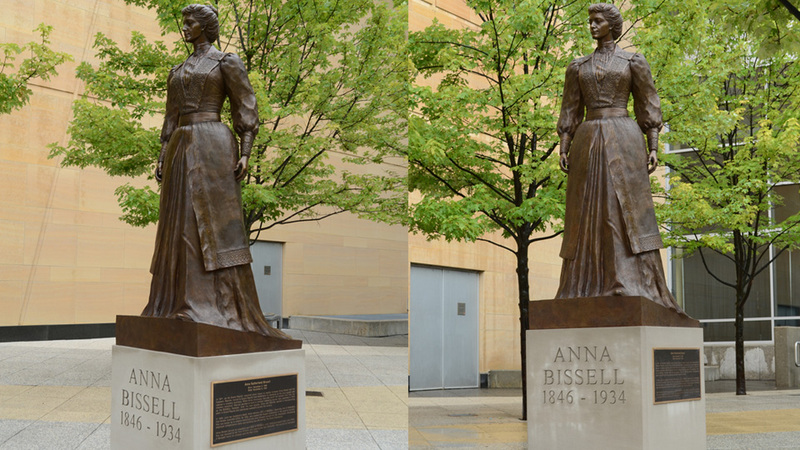 Anna Bissell is my first sculpture of a woman commemorated for her achievements. 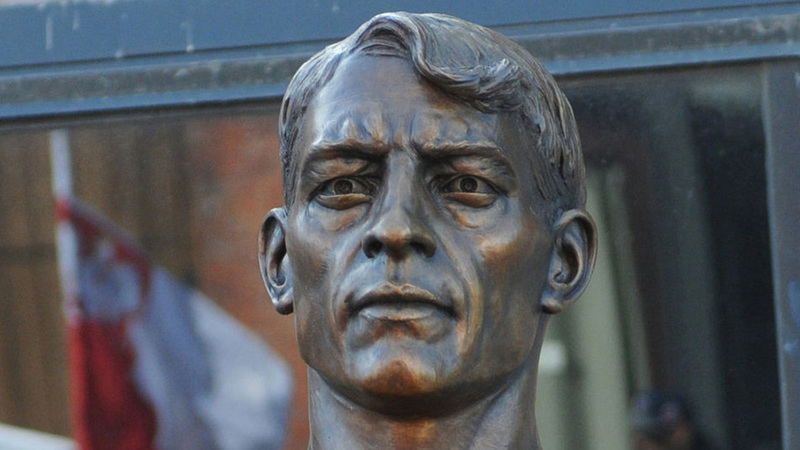 Examples of such statues are still relatively rare in public art. History has not always recognized people equally for their great works. If our landscape of public art is meant to speak to who we are, how we got here and who we aspire to be, then it must reflect the many different faces that human achievement wears.